Boil lentils in salted water. Simmer until tender. Drain, rinse with cold water, set aside. Saute onions, garlic, carrots, and celery in olive oil over medium heat until soft. 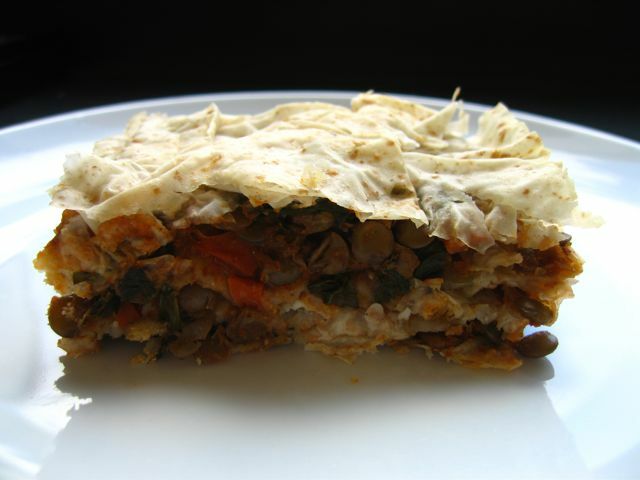 Add remaining filling ingredients (including lentils, excluding feta, spinach and parsley). Reduce over medium-low heat, stirring occasionally, until no liquid remains. Remove from heat and add spinach. In a bowl, mix parsley and feta crumbles. In a small saucepan, heat Earth Balance and milk until melted, remove from heat. To assemble, place two sheets of phyllo in the pan and brush with the EB mixture. Spread a thin layer of the lentils on top. Add two more sheets of phyllo, brush with EB. Add a layer of the feta and parsley. Continue layering until all the filling is used. Finish with a layer of 2-3 sheets of phyllo then brush with EB.